UPDATE: Try using BC547 as transistor people have reported problems with 2n2222. 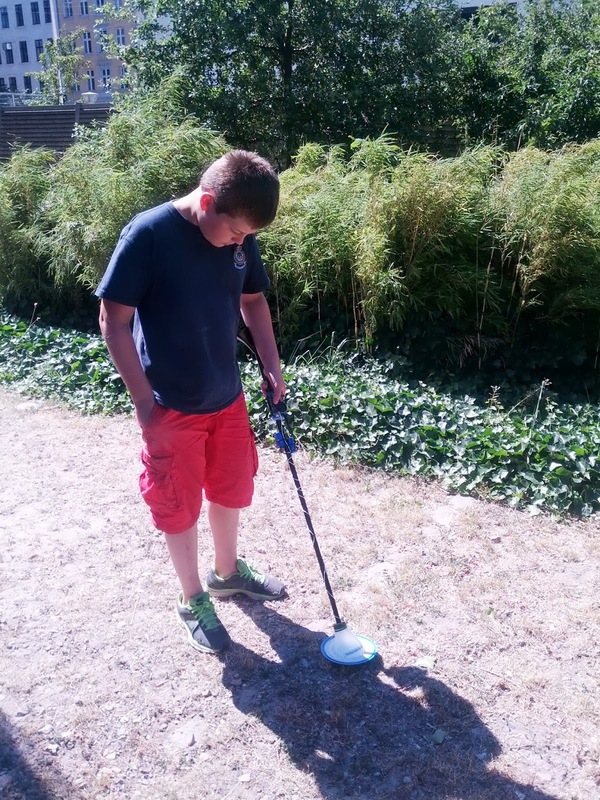 Me and my son decided to go treasure hunting with a metal detector that we have but we couldn't find it anywhere. Being proper makers we decided that it would be more fun to build one ourselves rather than keep trying to find it. Most metal detectors uses a search coil that act as part of an oscillator circuit. When metal is put in proximity of the search coil the frequency of the oscilations changes. Many metal detectors (including the one we can't find) uses another more stable oscillator BFO (beat frequency oscillator) to act as a reference for the frequency of the search coil. Usually the frequency of the BFO is adjusted to exactly match that of the search coil oscillator when no metal is present near this. The signals from these two oscillators are then fed to a, usually analog, circuit that create an output proportionally to the difference in frequency og the two. This may be either an audiable tone and/or some meter reading. The oscillator circuit feeds a around 160kHz signal to pin 5 of the Arduino. 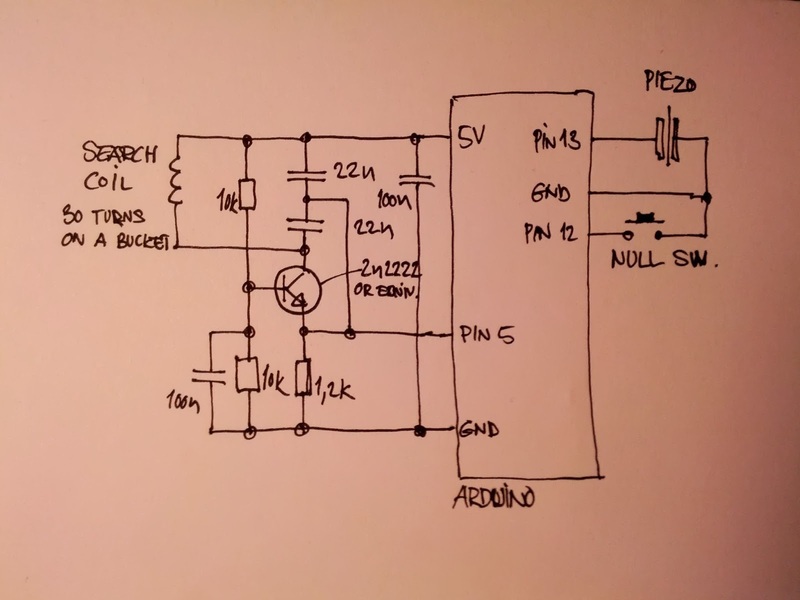 The Arduino sketch then measures the frequency of this pin very accurately. When the 'NULL SW.' button is held this frequency is stored. Any deviation from this frequency is then represented as a series of 'geiger counter' clicks on the piezo. The rate of the clicks increases as metal approaches the coil. 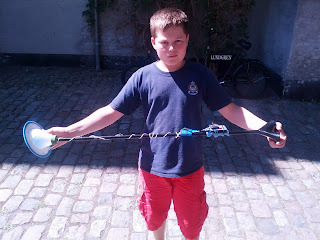 We tried different search coils and found that around 30 turns of wirer around a 15cm. 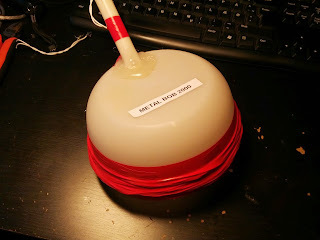 plastic bucket worked well. All we needed then was to tie it all to a discarded Ikea lamp and hey-presto off to the beach to find treasures. The metal detector has excellent sensitivity and by changing the SENSITIVITY value in the Arduino sketch you are able to tune it for both small and large objects. Here is the source code if you want to build one yourself. Great build! 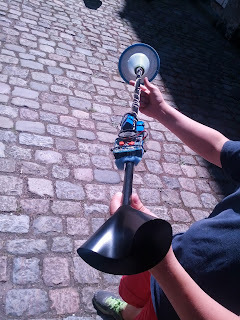 What was the model # of the Ikea lamp you used? I think it should work just fine as it has a total of 5 available pins... you could even add a button for sensitivity "up" or "down"
Great project! How sensitive did it turn out to be? how far(deep) can it detect a coin sized object ? Nice ! Few days ago I decided to build one with my father, too. Odd :). What diameter is your wire ? Wire is just plain 0,12mm2 plastic coated wire not critical.. I will try and make a TINY45/85 version and post it here..
Tiny45/85 came to my mind as saw the schematic too! Well Done! I would appreciate if you elaborate a bit the frequency oscillation part of the circuit. A very interesting project! The transistor must be necessarily 2n2222? I used the KT315, did not work. А катушку мотал как они писали ? просто я сделал 15 витков и может быть по этому не работает ? Nice project - Any improvements you have come up with after some field testing? I added a 10K pot to an analog pin, using the value to set the sensitivity at the same time as null. Have not had a chance to test it out outdoors yet, but my kids are sure to enjoy this! Cool. Thought about that too :) Let me know if it works. What you need to do to change the sensitivity? Заработал ли у кого нибудь на Arduino UNO? PIN 5 analog или PIN 5 digital? PIN 5 PIN 5 analog or digital? Nice project! I got this to work using the BC547 as you suggested. One thing I'd like to point out to your readers who also try this circuit is that you need to be wary of prototyping this on a breadboard. The parasitic inductance, capacitance, and resistance can cause problems at this frequency in the circuit. I could only keep this circuit stable for about a minute or two before these effects broke it down. For those who try, this is how I got it working. Without any changes to the circuit or the sketch, try setting the sensitivity real low (Ok, one change in the sketch) and then sense a big piece of metal (I set 100, sensing a pair of pliers at 5 cm). That should be good enough for a proof of concept. I used 30 turns of 29 gauge magnet wire around a 15cm diameter form. Also watch the quality of your loop as that will impact performance - keep it tight and compact. Finally, I suggest prototyping with an external supply voltage to further remove secondary effects from your PC connection. I used a 9V battery to an Uno board. Really awesome and thanks again. Clever circuit. I'm going to etch a board in the coming weeks as time allows to build this proper. Hi what kind of capacitor did u use ? ( AC / DC ) ? I got It working but it is really sensitive to electric environment. Could someone post a firmware sketch with variable sensitivity with a Pot adjustment. That would be awesome! Great project. Thous I am not very familiar with metal detector stuff and don't completely understand how everything works. I add some stuff to Your code - also pot adjustment. Maybe will soon put code and entire project on my blog. I use 2n2222a and it works ok. Range could be better. 1. If we use 12v to coil could it boost up detecting depth? 2. Why not to generate pulse with arduino microcontroller? Then it would give possibility to test different frequencies. Of course we need to add additional components. 3. I read about BFO concep. But did not completely understand how timing calculation works in this code. Can somebody explain code in details? please tell me how to do a sketch that was not PIN5 the other? how did you do with it, did it work with you? mine not, i have arduino unor3- i changed windows up to 10 and different arduino software. it up loads the sketch but never respond. Which construction of coil is the best? red or blue? Could you clarify capacitor types and values please? Are you sure this circuit works??? anyone here tested it, cause most of people here have issues. Many thanks for your reply :). Do you know where is the right place to put the speaker? and.. Whats means "piezo" in the circuit... maybe means "piezo-electric crystal"? 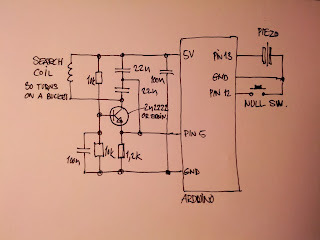 yes it's a piezo electric like this http://i1-news.softpedia-static.com/images/news2/Piezoelectric-Crystals-Turn-Roads-into-Power-Plants-2.jpg, one pin goes to ground of arduino and the other goes to pin13 of arduino, watch out for polarity! The circuit works, but I did not use the code mentioned here, I created my own, so I cant really comment the code. Nice project, but I'd like to know more about the oscillator circuit... a LC circuit produces a oscilatory signal when you apply a DC current? ... didnt know that. the transistor part of the circuit, is it just to change the voltage level? it has nothing to do with the oscillator part? hi xouri can you upload your code? Because i've triple checked the schematic and my coil is fine but still doesn't work, but I couldn't understand the code well cause i'm a beginner in programming. I am trying to build this on my own, and I would like to know if you built it using a breadboard or a PCB. and if you could tell me more about it. Thanks! Hi, i have problem. Your shemat and Dzl's Evil schemat doesn't work. And I dont know why. Do you run this scheme? Why my "metal detector" always makes the sound, even if I press the "null" button and I change the sensitivity? Help please, thanks. Hi, I'm try to upload this code in arduino mega and it doesn't work. I guess the problem is a timer. I'm very newbie and I don't know how to fix it. I have 2 problems. The BC547 misplaced (lol) and Mega only have 2 external timer 0 and 5. I changed timer 1 for 0.
but i have a small question .. if i want to increase the range of detection to about 40 or 50cm under ground .. I believe that the diameter of the coil reflects the distance. Larger coil equals longer distance but also require proportionally larger objects. I just finished building and testing. It works great!! The only change in circuit values I made was to use a BC337-25 transistor (since I had a bunch of them that I'm trying to use up.) 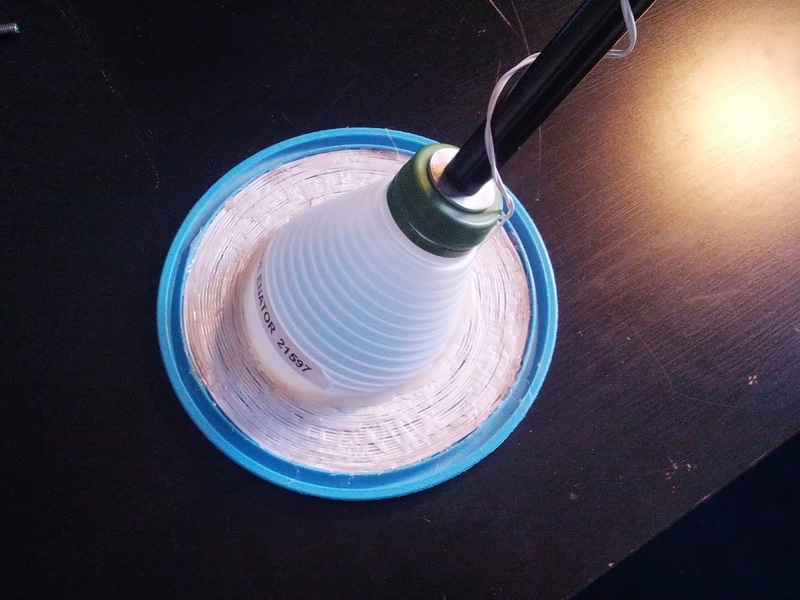 My coil is 30 turns of #27 magnet wire wound around a plastic jar lid 12.5 cm diameter. I set the Sensitivity parameter at 1500 in the sketch but it works fine from 500 to 3000. At 1500 it will reliably detect a US penny coin from around 5 cm. It will detect an aluminum beer can from around 14 cm away. It seems more sensitive to non-ferrous metals than to ferrous but detects my pocket knife quite well at 8 cm distance. I put a red LED and 1.8K resistor in parallel across the Piezo element to act as a visual indication since the Piezo ticking is low in volume. I used poly film capacitors for all 4 caps and constructed the circuit on a piece of wood with bare copper wire busbars and a socket for the transistor. The Arduino code compiled and runs without problems on the genuine Uno. The base frequency with the coil I made is around 90kHz. I'm going to add a pot and statements in the code to set Sensitivity using analogRead and map statements, but at 1500 it seems to work quite well. Thanks for a cool project! Thanks again for a neat and instructive project! I have tried with 2 different push buttonts but no success. I don't know what to try anymore. Can someone please help me? I have put Serial.print -messsages around the code and that part is newer executed. Thank you for your help! What Arduino version are you using? I copy-pasted the sketch code directly from the link above, into the IDE and it compiled and ran properly without any alterations. But because of the way the timers are called in the code, it may be specific to the ATMega328P . I just tried it on an Arduino MEGA with the ATMega2560 chip and it does not work, but it works fine with the Uno and ATMega328P chip. I think this is because of the way the timers/interrupts are called in the sketch. to see if modifying the timer numbers will help. Or just try it with an Uno using the 328P chip. Hi. Can someone draw layout for this project? Can the author (or anyone who has successfully used the schematic) clarify the capacitor values, since the handwriting is a little ambiguous? I initially assumed the units were microfarads (μ), but my friend thinks it's nanofarads (n). Thanks! James Dinsmore post on November 30, 2014. Also some have videos. Like TinselKoala post from June 13, 2015. To all the people that say that the NULL button doesn't work. You are probably not getting a signal from your oscillator. Check your circuit. Make sure you are using Nano Farad capacitors. Nanofarads :) and remember the transistor is a BC547 not 2N2222! Very well done, I made it today exactly according your description except the transistor which I use the BC547 and it works fine from the beginning. I like to know or some one has a description and code for adjusting with potmeter. Today I use it as a pinpointer small coil around ferret rod. Also change to sound to more high tone, see part of sketch below. Arduino: 1.6.7 (Windows XP), Board: "Arduino/Genuino Uno"
hi i built the metal detector but my was un stable and relly jumping around eaven when not moving anything, and when i went out in lower temperature about 0degrees celsius it went ballistic. how can i solve that problem? waiting for the proper components and wire. then will connect the artduino. great project. Если 30 витков проводом 0.2 по каркас 13 см, работать будет? 4) The capacitor values are nanofarads! // REMEMBER TO PRESS NULL BUTTON AFTER POWER UP!! t = micros() - t0; // Wieviel Zeit ist zwischen diesem und dem letzten Interrupt vergangen? Code above does not work since some parts of the program are missing. Does anyone of you guys have code running on an ardiuno mega 2560? Your blog is much effective and thanks for sharing information..
Voce pode me dizer quais sao os resistores da esquerda do esquema? Does anyone have code for the arduino Mega 2560? since T1 is missing i was not able to get it run with Timer5, T5 on Pin47 :-/. Wow! That's interesting! What's specialty of this than Underground Gold Finding Machine ? @Adviser Street - Scum sucking pig of a spammer just go away. Geek Physical, or someone who understands a lot of arduino, I managed to make the detector work, but I wanted to make some modifications to heighten the sensitivity, could you explain to me how the main functions and methods of the algorithm work? I would like to build this nice detector. Can you please put the sketch in your blog instead of in a non functioning dropbox link. En utilisant un Arduino UNO (velleman), 2 condensateurs de 22nF et 2 condensateurs de 100nF, 2 résistances de 10kOhms et une résistance de 1.2kOhm et pour finir un Transistor BC547. Pour le piézo j'ai utilisé un vieux écouteur. Bien faire attention au câblage, au câblage du transistor (Base Collecteur Émetteur). Le montage n'est pas très stable mais fonctionne assez bien, par contre la distance de détection est faible, pour une grosse pièces métallique environ 20cm, par contre une pièce de 2€ n'est détecté qu'à 5cm et assez difficilement, je vais essayer de réfléchir sur ce point. Merci à l'auteur de ce projet ! hello hi !distance detect for coin 2euro 5 cm ? test with 5 pence (20mm diameter coin) detect 6cm.example 2 metalic box diameter 7cm detect 15cmm(6 inch) thanks! Have you heard about Publish Green? You’ve probably seen our Ebooks all over the place. We’re the leading free Ebooks for the world. We’ve just launched our website Arduino Projects pdf where we give away the best free Ebook resources out there. We’d be stoked if you could add us to this list. Built one and finally got it working. Used the 2n2222 transistor. The oscillator was showing about 120khz. Once I get the coil mounted on something I'll start trying to tweak sensitivity setting. I noticed even touching it with my hand showed a reaction. Thanks for sharing nice information. KRB Geo Services is authorized supplier offering a wide range of products like 3D Metal Detectors, Ground imaging systems, Gold metal detectors and okm metal detectors. Hi ! Impressive content. People are still not sure what particular steps to take. Now, I think your initiative is well understood to target those to learn the basics. This stifftree is most appropriate to it do click and visit. Thanks sharing.